Well, last week I kicked off a new series called Forgotten Horror Gems. For those that are just joining the blog, here's how it works. 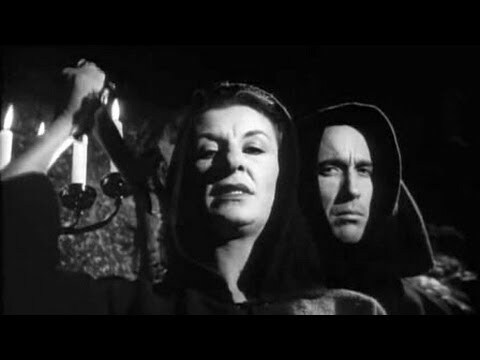 I pored through listings of horror movies from 1920 - 1989 and looked for films I hadn't seen. Admittedly, that list is actually pretty short considering all of the movies that were released over that period. I'm not bragging. I could have been using that time to solve world hunger but hey... it is what it is. Over the next twelve months, I'm going to work my way through the list and amazingly, my wife and daughter both agreed they'd like to participate in this as well. So without further ado, I present to you a movie that I've been intrigued by since I was a child. I've seen stills from it in magazines like Famous Monsters of Filmland, but amazingly I'd never actually seen the film. So here we go! First of all, how beautiful is that poster art? I don't want to get too far off on a tangent here, but my friend Mike Carvalho was the one who first really opened my eyes to the beauty of classic movie posters. I may post more about that at another time, but just let me say that you will not find a poster that looks anything like this coming out of a movie studio today. Look at those colors! Look at the unfeeling, malevolent expression of the mad doctor and the fear on his victim's face. That's how you sell a movie! 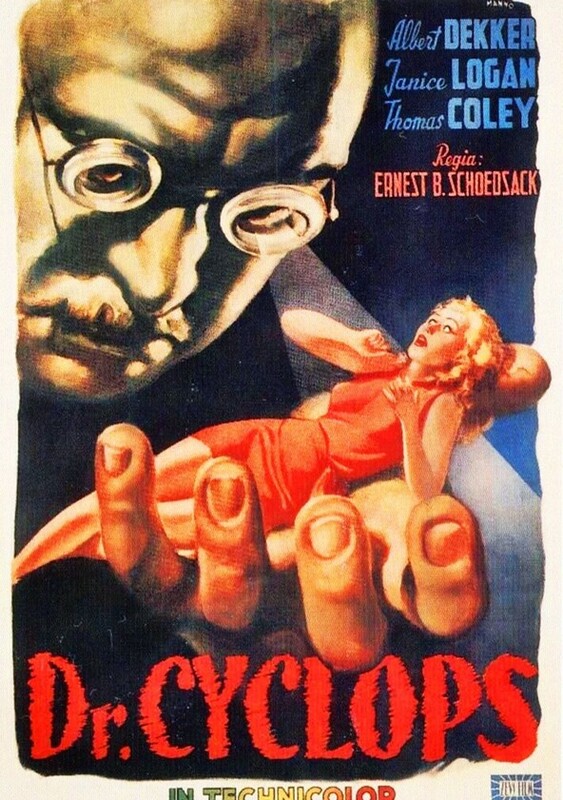 Dr. Cyclops is about a well-regarded scientist who has secluded himself in a laboratory in the jungles of the Amazon. While that may seem weird, the truth is he's there because of a giant deposit of pitchblende, a mix of uranium and radium if I understand the explanation correctly. This geological cache of radioactive riches holds a key to the experiments he's conducting. He has one problem though. His eyesight is horrible. Despite thick, coke-bottle lenses, he's now lost the ability to look into his microscope clearly, so he summons three scientists from America to come verify something for him. The three travel thousands of miles through the jungle and once they arrive and confirm his theory he thanks them and asks them to leave. Needless to say, these three (four if you count the mule driver) didn't travel all that way just to look in a microscope for literally five minutes and be turned away. They want to know more. Soon, they find out first hand what the doctor has been working on. He's discovered a way to shrink living beings and their confirmation of his theory removes the last obstacle he had in making the process safe for his subjects. In order to keep them from returning to the mainland with his secrets, he shrinks them to try to keep them captive. 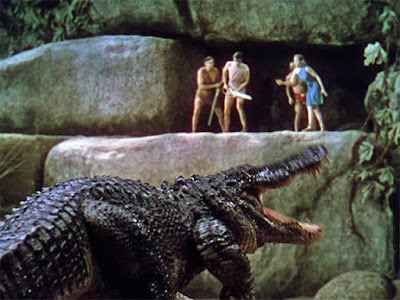 Of course, they escape and then have to dodge the terrors of the jungle itself before finding a way to deal with the mad doctor and return to their normal size. 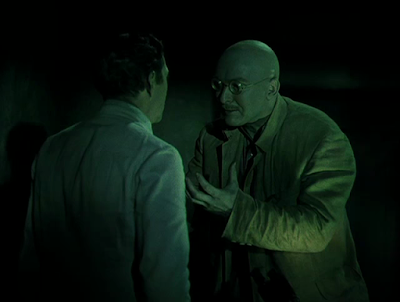 Now, I'm not going to sit here and tell you that Dr. Cyclops is a great movie. 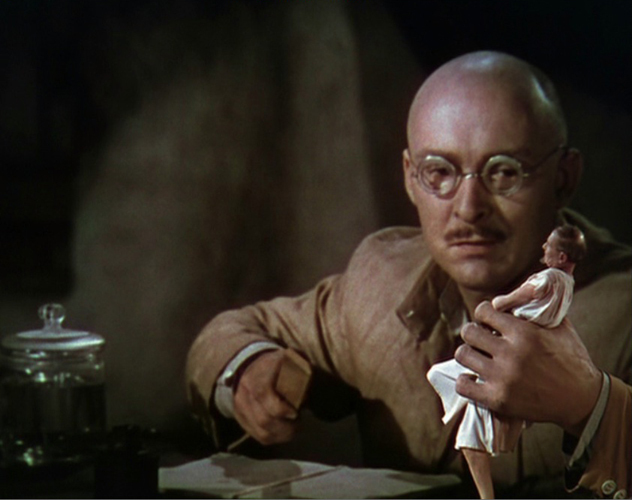 Personally, I have never been exactly wowed by movies about people being shrunk down to the size of dolls. I just feel like it's a gimmick that quickly runs its course. 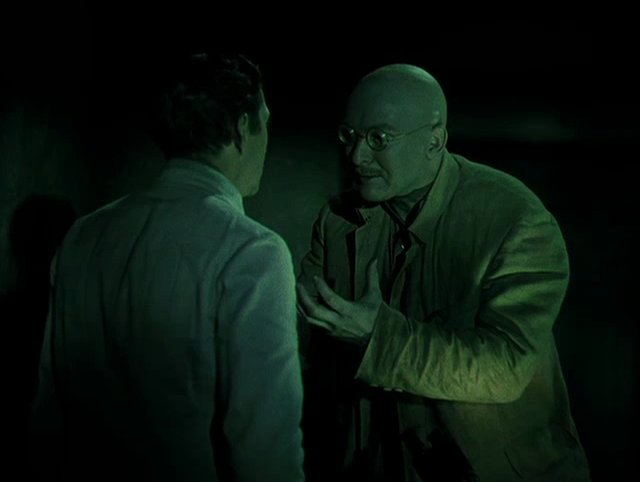 That said, Dr. Cyclops does have some pretty amazing effects and while most of the performances are standard, Albert Dekker's performance as the title character shines. He's not the kind of mad scientist who is doing evil unknowingly (a la Dr. Frankenstein). He truly is evil, making some horrific decisions including randomly killing his subjects. 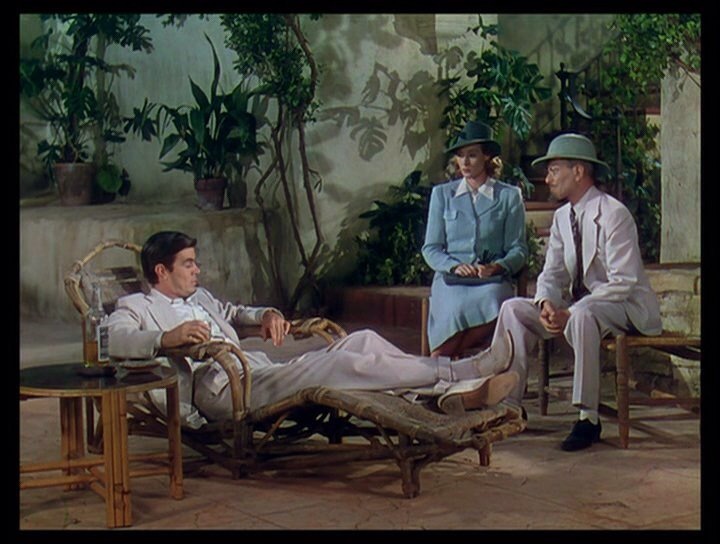 The version of this we watched was in gorgeous Technicolor also. It was a joy to see with all the heavily saturated greens of the jungle throughout. The very first scene has some crazy "fish tank" blue lighting thing happening with ripples flowing across the walls and the doctor. Seriously cool! But all this aside, how is it as a movie? Well, I'll ask the girls to explain. Karen: First of all, I felt deceived by the movie title. I was expecting a giant cyclops monster. I had no idea where the movie was going so when it turned out that wasn't the case, I felt a little cheated. Lilith: That didn't bother me because I didn't know the name of the movie. I came down after the credits. Karen: Aside from that though, I liked this. I really liked the small people and how everything became giant; like sewing needles become giant weapons in their hands, etc. It made me think about all the prop departments and how they had to make this stuff. Lilith: I liked how they would all work together to defeat the doctor. It reminded me of the scene in Cinderella where all the mice and birds come together to sew her dress. Okay, all this is great, but what about the story itself? Did you like that? Karen: Honestly, I did. It was fun and nostalgic, but the acting was atrocious and some of the dialogue was horrible. It was still fun to watch. I loved how they paraded all of these exotic animals around just to try to convince you it was really shot in the jungle. I swear, there's a point where thirty animals show up one at a time on screen and to be honest, I'm not even sure they all really exist in the same jungle. It was like being at the zoo. 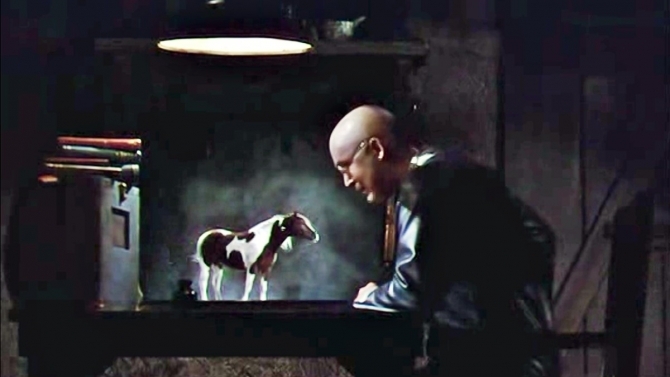 Lilith: I forgot about the tiny horse! They were mean to the tiny horse! Karen: Yes, I wanted the tiny horse for my own. He was really cute, but they treated him very badly! Lilith: Yeah, when that guy slams the door shut on his box, that was just rude! To be clear, people die in this movie but the tiny horse is not harmed in any way. Slamming the box shut was the extent of the harm done to the horse, but this seems to have stood out to the girls. 1. Dr. Cyclops is not about a cyclops, but isn't a bad film. 2. It looks really nice but the acting isn't the best. 4. Don't be a jerk to the tiny horse. From my perspective, it's a fun watch but not essential. If you're looking for a nostalgic trip one night, you could do worse than to check this out. You can find it streaming on Amazon Prime. If you'd like a look at the trailer, here you go! Next week, we'll go back to the black and white classics for a forgotten Boris Karloff movie. Until then, check out my series on exploring Japan or visit my Amazon Author's page! On our very first visit to Japan, my family and I split our time between a week in Tokyo and a week in Hiroshima. Part of the reason was that for three years, I lived in a small town called Iwakuni, about 45 minutes from Hiroshima. It had been my dream to go back and visit the places I used to go and since (at the time) we thought this would probably be the only chance we'd get to go, we made it a priority. In planning the trip, we realized that even by bullet train, we were going to have a full day of train riding just to get from Tokyo to Hiroshima. Round trip, that was going to cost us two days doing nothing but sitting and watching the world go by at 200 m.p.h. We started looking for someplace in between where we could stop for a day and see something unusual. It didn't take long to find that we were going to be traveling right through the largest tea producing area in Japan. Now, my wife doesn't like Japanese green tea, however she does love touring factories. 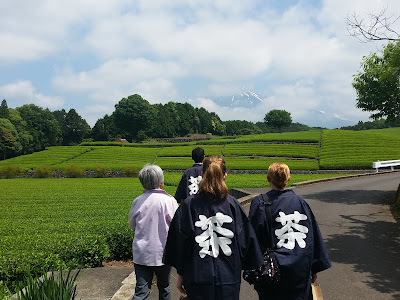 After some poking around, I found a local guide named Yumi who offered tours of the tea plantations in the area and we booked a stop for two nights in Fuji City. 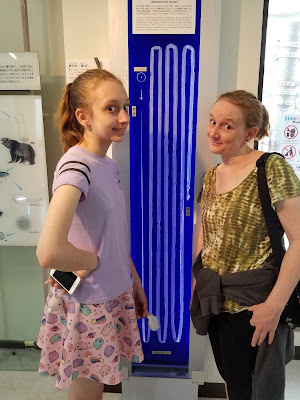 Once we started corresponding with Yumi, she started recommending other places we could visit in the same day, including a sake brewery. I have to tell you, there is no place I have found that's more beautiful than this tea plantation with majestic Mt. Fuji peeking through the clouds. Yumi introduced us to our tea plantation guide and he quickly walked us out into the fields. They'd recently cut the tea leaves but had left one row uncut specifically for us. After the tour of the plantation and some tea leaf picking, he led us to the factory itself. Here we watched as truckloads of fresh green leaves were dumped into a hamper and started on their way through processing. The machine itself was huge and housed in a small warehouse that barely contained it. As a result, I wasn't able to get a good picture but below is what the dried leaves look like when they come out, ready for brewing. Following the factory tour, Yumi took us to a small restaurant where we passed the tea leaves we'd picked to the owner. As explained to us, the restaurant is owned by a retired woman who just loves cooking. She opens only for lunch and only cooks with what she has available that day. All of the ingredients are fresh and local. The result was a lunch of many small and incredibly tasty items, including tempura fried tea leaves. That's right, instead of brewing our leaves, she fried them and they were delicious! After lunch, Yumi and her husband/driver took us sake tasting. The brewery sat about a half hour from the restaurant and the drive there held incredible views of Mt. Fuji. Once out of the car, we noticed that a small stream was flowing right alongside the road. It was crystal clear and ice cold. The water originates from Mt. 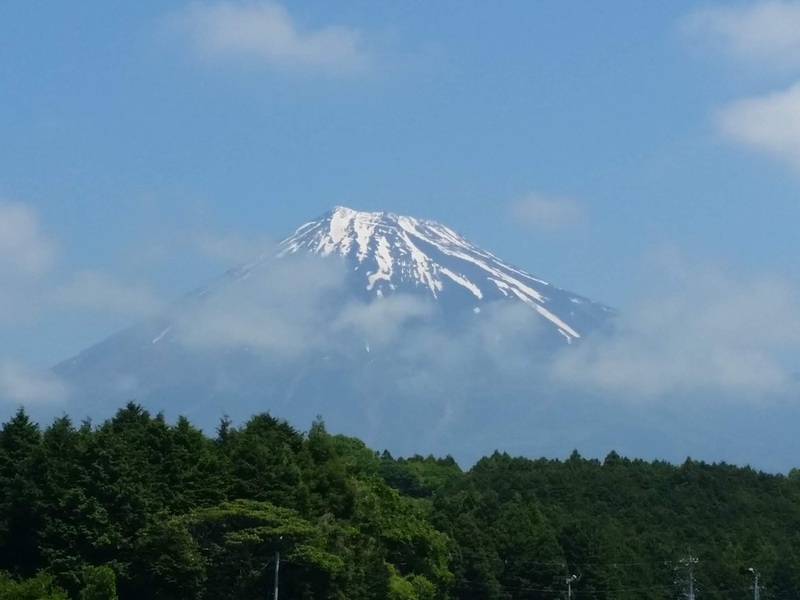 Fuji and is the same water the brewery uses. If you've ever seen this ball on a sake label, you may have wondered what it is. Well, as explained to us, a sake brewery will hang it outside their shop when they are releasing a fresh batch, usually once a year. The ball will be green when hung and then allowed to dry up over the year. You can tell how fresh the sake is going to be by the state of the ball. Don't worry, even though the sake may not be right out of the cask, a quality old sake is still very, very good. Many people think that you have to drink sake hot. That's not so. In fact, heating sake is sometimes done to mask bad flavor. High quality sake is meant to be tasted at room temperature and let me tell you, this place had some excellent sake. By the way, that's Yumi pointing and her husband is standing next to her. She asked as we walked in whether we liked sake and I said I did. She winked at me and said, "My husband and I are lushes!" 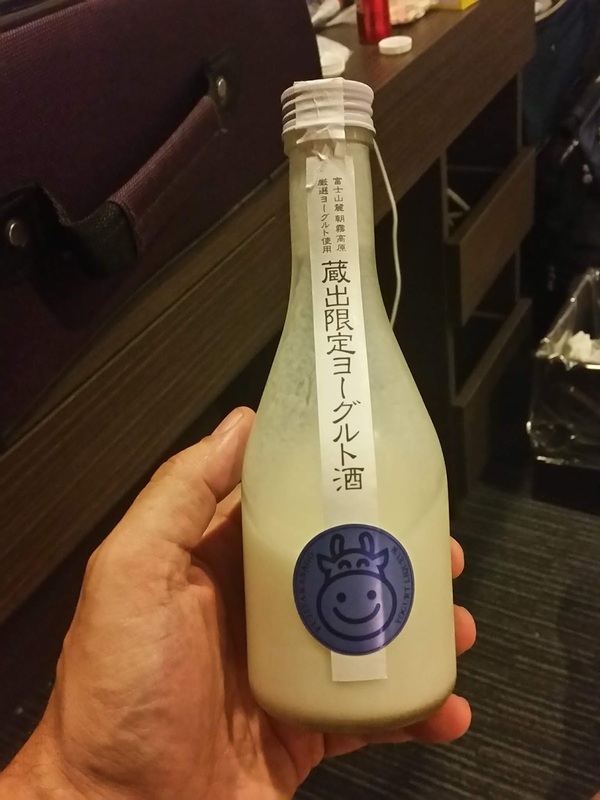 This is a milk sake. It's like a drinkable, alcoholic yogurt and it was freakin' AMAZING! We grabbed a few bottles for home and for gifts and prepared to leave, when Yumi suddenly got excited. While conversing in Japanese with the master brewer, he'd dropped a really cool bit of information. Over a century ago, not long after the brewery was founded, an edict came down from the government that sought to banish Buddhism from Japan in favor of the state religion of Shinto. As such, soldiers were removing Buddhist iconography from around the area. The owner knew that along many of the trails up Mt. Fuji, there were beautiful statues perched in places of worship. He couldn't bear the thought of those being destroyed, so he decided to make a series of clandestine hikes up to save as many as he could. Once he brought them back, he created an alcove in an upper area of the brewery and placed them there for safekeeping. The Master Brewer asked us if we'd like to see them. And so, we were led up some stairs and along a catwalk that was obviously not built for tourists. There were no handrails or safety netting. This was a place just for the employees and owner, but here we were, getting a peek at something special! 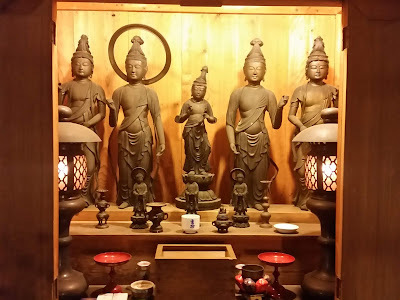 High above the giant sake casks, there was a wooden floor and at the end sat the statues. They were absolutely gorgeous and knowing we were seeing something exclusive made the moment even more special. Yumi, her husband and our family hit it off. They've invited us back to stay with them if we're ever in the area and while we haven't taken them up on it yet, we may still do so. They had such a good time with us, they asked if we'd like to go for ice cream at their favorite place. It's a small shop owned by a dairy next door and it was so far up a foothill and off the beaten path that no tourist would ever have found it without some local help. After that, it was back to the train station and then to our hotel. What started as a way to break up our trip, became one of our most memorable and favorite days in Japan. So once again, I'll implore you to seek out the stuff away from the crowds. While tours are great ways to see a lot in a short amount of time, you will only scratch the surface. Wandering off on your own almost always yields fantastic results. And by the way, the cost of our day with Yumi as our personal guide and translator came out less than most of the tours available to us in Tokyo. As most of you know, this blog was started primarily because I wanted to promote my book The Wash. It's a horror novel and as a gigantic fan of horror, I've recently found myself speaking to different book clubs and writer's groups about the genre. I'm almost always asked questions that require me to call upon films to illustrate my point. Well, most of these people may have never read a book in that genre, but have likely seen a horror movie or two in their lives even if they don't realize it at first. Case in point, ask someone if they've ever read a horror book and they'll say no. Ask them if they've ever seen The Silence of the Lambs and there's a good chance they'll say yes. While that film isn't horror per se, there's no arguing that Hannibal Lecter's escape scene is pure horror with gore thrown in for good measure. All of this has pointed out something I've known for a while. 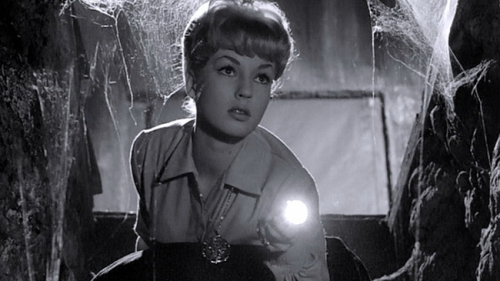 I've seen a ton of horror movies and the older they are, the more I tend to love them. So, I've decided that in 2019, I'm going to seek out the obscure titles that I've missed. Some of them may have been on my radar but I've never had occasion to check them out. Others will have been complete surprises that I stumble upon while looking for content. 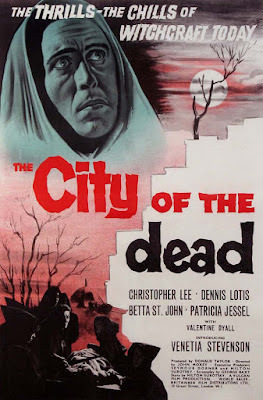 The City of the Dead stars Christopher Lee, Dennis Lotis and Patricia Jessel. It tells the story of a young college student (Venetia Stevenson) who visits a quaint New England town while working on her senior term paper on witchcraft. When her brother and boyfriend don't hear from her, they follow her trail in an attempt to find her. The City of the Dead is incredibly atmospheric. The town drips with dread and mystery. Thick fog and rundown buildings populate the streets and the townsfolk are obviously not exactly normal. That said, the plot does leave something to be desired. Here, I'll let the girls explain. Karen: This has to be one of the stupidest movies ever! Every single thing was laid out with gigantic clues. If someone reads that a witch needs a personal item to curse someone, the very next line is literally, "Oh, by the way, I seem to have lost my pendant." Lilith: And the girl doing the paper is completely clueless. Everyone does exactly the opposite of what you would do in real life if weird stuff like this happened. I did ask each of them to give me one thing they liked about the film though. After all, shitting on a movie is easy. For me, the good thing is definitely the atmosphere. There are scenes where a hapless driver will pick up a mysterious man by the crossroads and they're incredibly effective. For Karen and Lil, well, let's just say the task of saying something positive was more difficult. Lilith: I liked the one girl's hair. 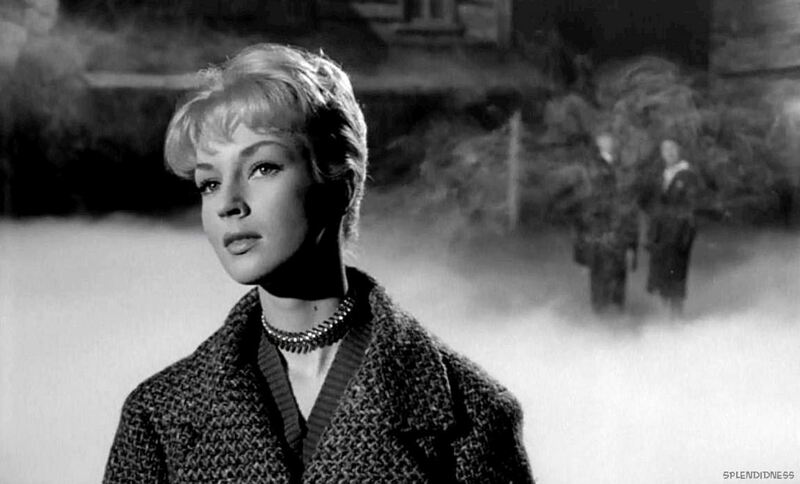 I also liked the priest and I liked how snooty the lady who ran the inn was. Karen: In the opening scenes with the college professor lecturing, I liked the snarky comments the boyfriend was making. Usually those scenes in these movies are from the professor's perspective so seeing it from the student's viewpoint was refreshing. Both good insights, but to be honest, I really had to press them for those. As it turns out, I had seen this one years ago. I'd just forgotten about it and that's pretty much the only thing you need to know. It's fun if you want something predictable and creepy but ultimately forgettable. Not a bad way to spend 74 minutes late at night but not anything you'll dream about later on. One down, and at least 49 more to go. I can already tell, this is going to be fun! First of all, I apologize for the three month hiatus. As I've mentioned before, life took a weird, hard left turn on me in the final months of last year and I'm just now climbing back out of it. 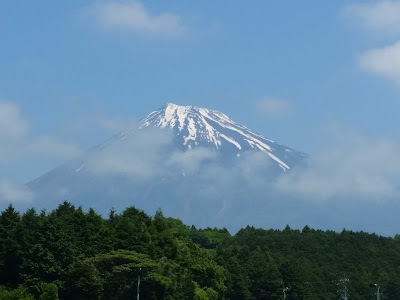 Many of you who followed the blog wanted me to continue the Exploring Japan series. When things came to a halt last year, I was probably about halfway through all of the interesting topics I had lined up. So with that, I'm picking up where I left off, however after you read this post, you may want to be careful what you wish for next time. 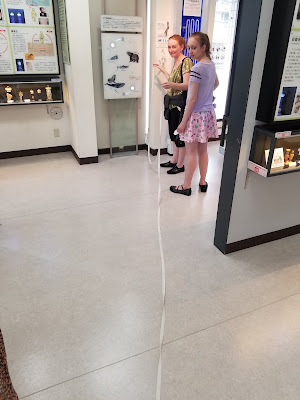 Tokyo has many amazing museums, most of which either offer English translations at each exhibit or some form of translation service. 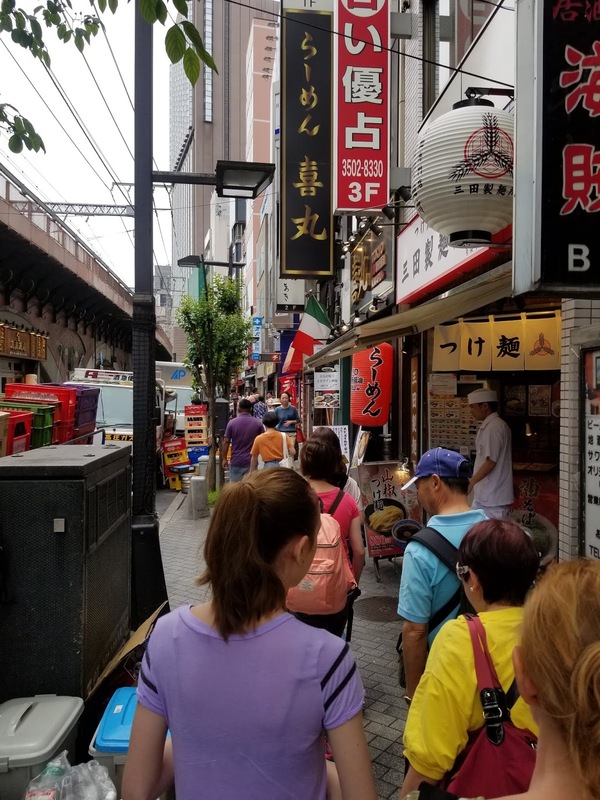 There's even one we'll talk about in a later post that offers free translators who will walk with you and answer all of your questions. While many of the museums are focused on art or history, there are a handful of strange ones here and there. One of the strangest is 100% free to visit. 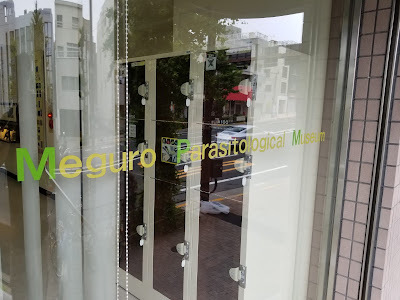 It's the Meguro Parasitological Museum in the Meguro neighborhood of Tokyo. It's tucked away among a number of nondescript buildings on the street pictured below and you'd likely walk right by it if you weren't looking. However, inside are some of the most interesting and (frankly) disgusting sights you will ever see. The museum is part of a private research facility that was founded in 1953. 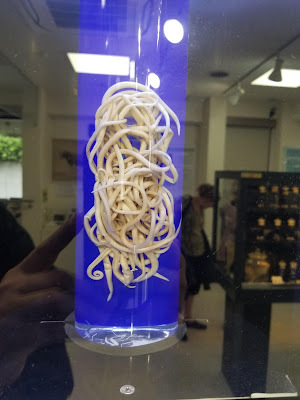 Currently, they exhibit about 300 parasite specimens over two floors. It's not a large museum, but there is A LOT crammed in here. Now you may ask yourself why would a parasite museum exist in Tokyo at all? 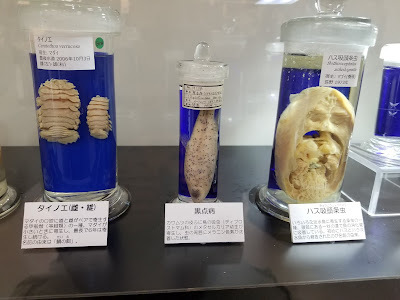 Well, the study of parasites and their effects on animals and humans had a direct effect on the quality of life for many people in Japan in the early 1900's. A doctor named Akira Fujinami made it his life goal to study a parasite that affected major portions of rural Japan. In those areas, as many as 30% of the people carried the bug. It's latin name is Schistosoma Japonicum, and it's something called a "blood fluke". If you've ever seen a picture like the one below, you've likely seen a victim of this nasty little creature. What drew Dr. Fujinami to focus on parasites was when he found one of the flukes while conducting an autopsy on an infected victim. He started to question how it got into its host and in an experiment designed to determine the parasite's life cycle, he arranged for 17 uninfected calves to range in the paddy fields and rivers in an area of Katayama where they knew the parasite existed. 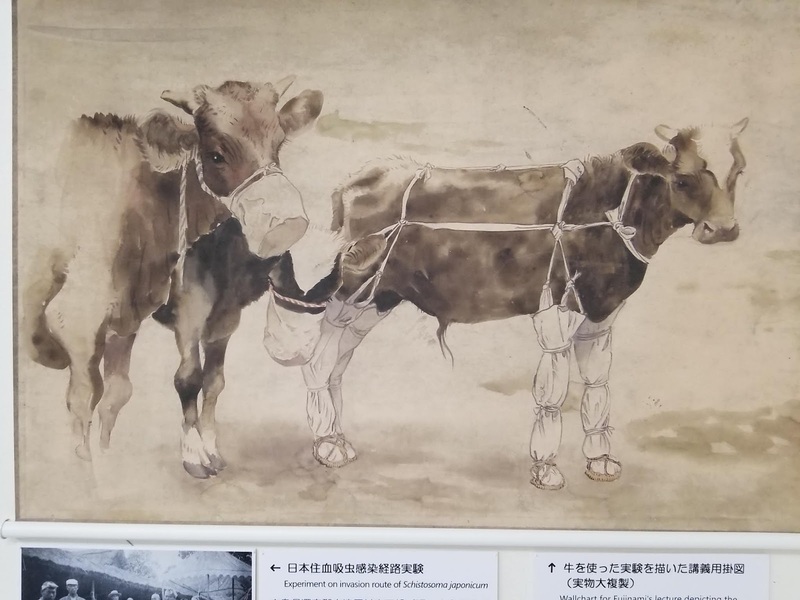 He divided the calves into groups. On 6 of them, he covered their mouths. He covered the legs of 7 others. He allowed 2 to roam free with no cover and the final 2 he kept in the barn all the time. What he found was that all of the calves without the leg covers became infected. 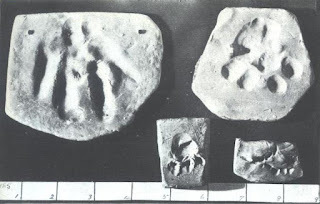 Through further study, he found that snails in the area were the intermediate hosts and that part of the key to wiping out the parasite was to eradicate the snails. 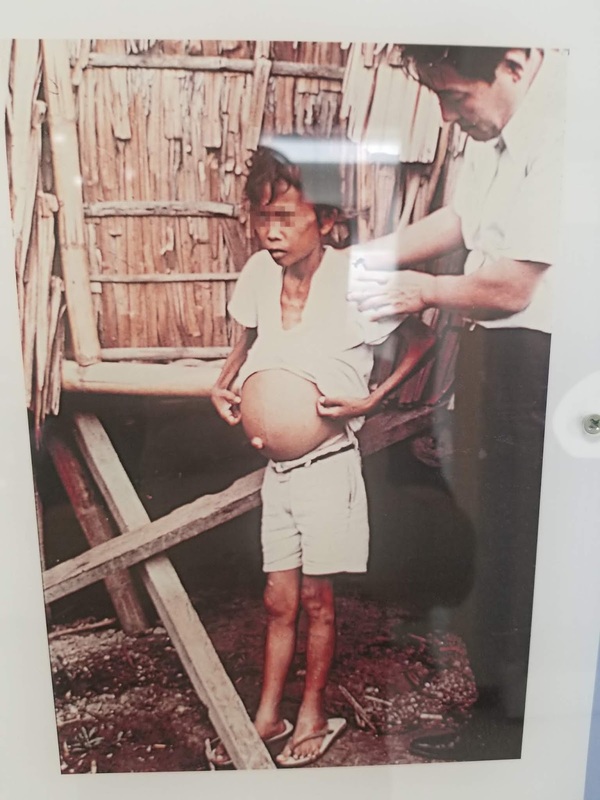 Between the time of this discovery in 1918 and 1950, the number of infected patients and deaths dropped from 2,500 to almost 0. The museum serves as a place to both honor the man's research and also open people's eyes to the vast number of crazy, creepy, crawly things you may not even realize are out there. A sea turtle head with a parasite growing right out of its mouth. The largest tapeworm ever pulled out of a human being. 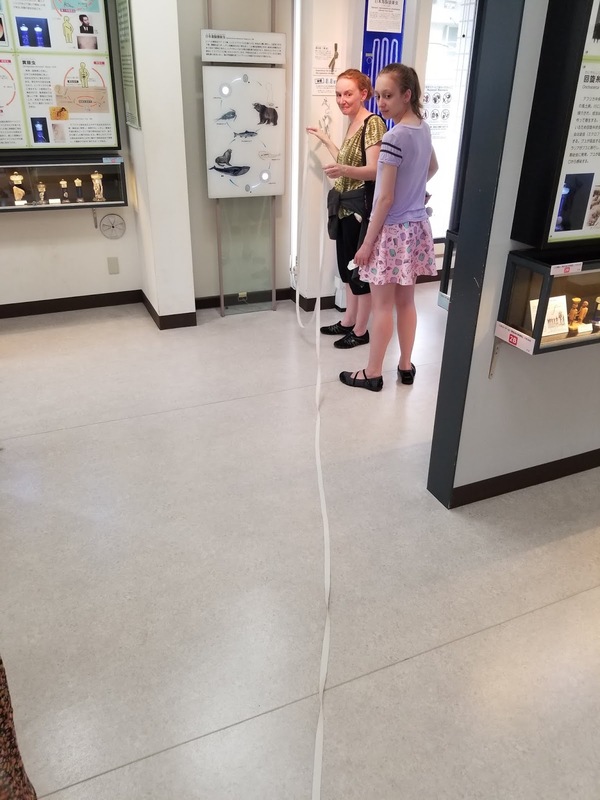 There's even a tape measure you can extend to get a better understanding of just how long that thing is. I'm holding the other end and am standing across the room and still can't pull it tight. 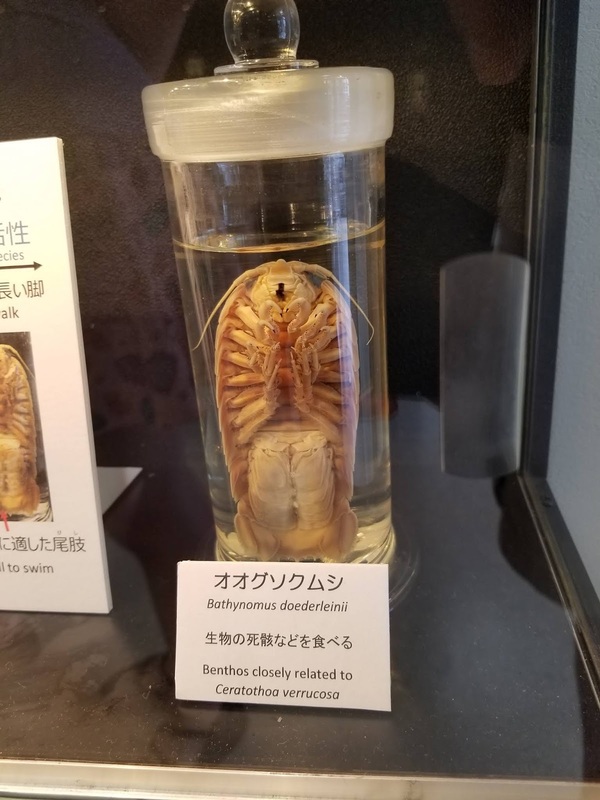 There seems to be no end to all the horrific specimens on display and trust me when I tell you that there are some pretty awful pictures of what these things can do. 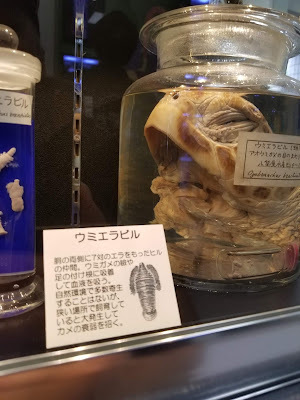 As we were looking at one particularly gruesome photo while trying to decipher a bit of kanji, we used our translation app and the following came up. Let's just say the translation was correct. So why come visit? Well, it's definitely weird. It's relatively easy to get to and it's extremely educational. Sometimes, knowledge is uncomfortable. Would I recommend visiting? Absolutely! If you read every single exhibit card, you could cover the entire thing in a little over an hour. Do it in the morning and you'll have the rest of the day to forget all the horrible stuff you'll see. At the very least, you'll never exit a bathroom without washing your hands again, and hey... the world can always use a bit of extra hygiene. Next week, we'll shift gears and talk about tea plantations, sake brewers and sacred Buddhist statues that were once illegal. You can find all of them in one town at the base of Mt. Fuji! I'm not sure how many of you read the AVClub.com site. It's pretty essential to me as it covers a wide variety of pop culture news. One of my favorite series is Wiki Wormhole. Writer Mike Vago literally jumps from entry to entry on Wikipedia and reports on it. The only real rule seems to be that the next topic is always triggered by something read in the current topic he's exploring. Thus you can have such disparate subjects as a ghost mongoose one week and dead currencies the next. Wait... did I just write the words "ghost mongoose"? You see, this week's entry was so fun, I figured I had to share it with those of you who don't know about Gef. 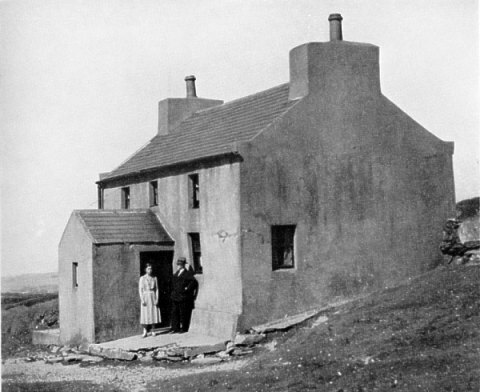 In 1931, a family living in a small farmhouse on the Isle of Man, reported that they had a ghost living with them. It wasn't an ordinary ghost though. 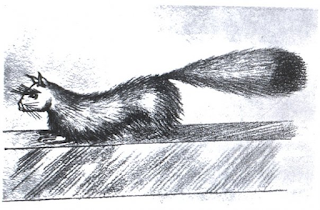 It was a ghost in the form of a "mongoose" from New Delhi, India. What's even better than that? That's right, the mongoose (or monghost if you really want to get weird with it) spoke to the family regularly. It referred to itself as "a ghost in the form of a mongoose" and an "earthbound spirit" among other things. It was also helpful. It would wake up family members who overslept, warn them when visitors or strange animals approached and was even responsible for turning off the stove when someone forgot. In return, the family left it food in a saucer suspended from the ceiling. The ghost became popular in the tabloids and various investigators came out over the years to report on it and try to see it for themselves. Ultimately, no photos were ever taken and though some visitors reported hearing the ghost talk, this was later reported to be ventriloquism on the part of Voirrey, the couple's daughter. Ultimately, prints and hair from the ghost mongoose were proven to be that of the family's dogs. Still, according to Wikipedia, Voirrey (who died in 2005) always insisted that Gef was quite real and was not a product of her imagination. One thing I find very interesting about this is Gef's assertion that he is an "earthbound spirit" and a "ghost in the shape of a mongoose". In the Shinto religion in Japan, there is the belief in "kami" that I've discussed when posting about the festival in Asakusa. 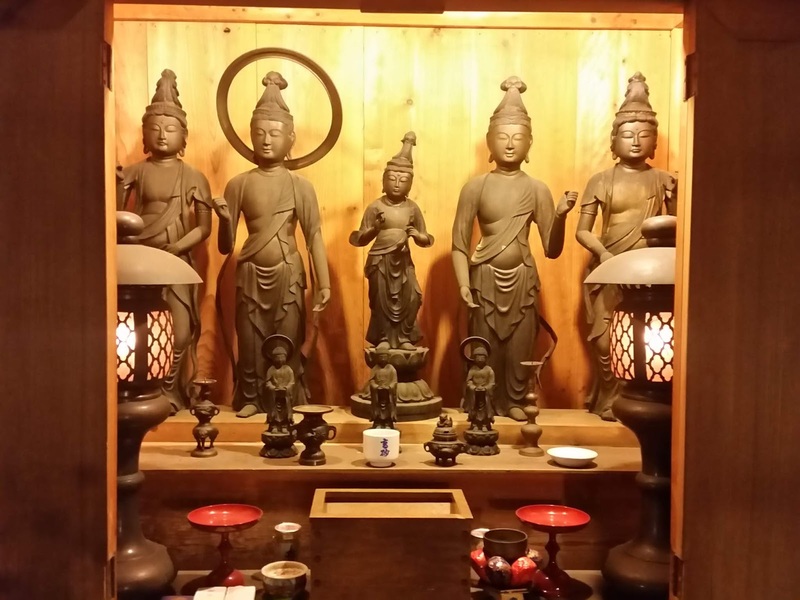 Kami is basically an object's spirit and Shinto teachings tell us they are found everywhere. The idea of a mongoose's kami finding its way to England from New Delhi and helping a family seems like it would make a hell of a great story. I know, I know. It’s been freakin’ forever since I updated this blog. Well truth be told, the last few months of 2018 were a little on the crazy side. Between big family losses, disappearing bosses (yes… there’s a story here but I ain’t tellin’ it) and the holidays in general it was a bit nuts. Every moment I had to write was spent on other projects, which is a good thing. After all, I’ve got books to put out and I’m so close to being done with the next one I can taste it. So while this isn’t an official “check out this cool thing I saw” post. It is a post telling you that in 2019, you can look forward to a continuation on the Exploring Japan series as well as some other stuff. Also, sometime between now and October, I hope to release the first volume in a series of books about a character that Will Mason and I created during a bad day at work many, many years ago. His name is Resurrection Phil and I’m really excited to finally bring one of his adventures to you all. He’s a hell of a guy, would give you the shirt off his back, but you may want to be careful about what you’re eating when you’re around him. Does that sound intriguing? Well, then stay tuned. The one thing I can promise you is that in 2019, I’ll be releasing some really weird stuff. I hope you’ll join me!